Mohawk Kateri Tekakwitha has become North America's first aboriginal saint in a canonization ceremony conducted by Pope Benedict XVI. Nearly blind Kateri Tekakwitha lived more than 3 centuries ago in Kahnawake, Que. Mohawk Kateri Tekakwitha became North America's first aboriginal saint Sunday morning in a canonization ceremony conducted by Pope Benedict XVI. She was among seven church role models named as saints as the sun rose over St. Peter's Square. Native Americans in beaded and feathered headdresses sang songs to Kateri during the ceremony. Known as the "Lily of the Mohawks," Kateri was born in 1656 in what is now New York state to a pagan Iroquois father and an Algonquin Christian mother. Her parents and only brother died when she was four during a smallpox epidemic that left her nearly blind and her face badly scarred. She went to live with her uncle, a Mohawk, and was baptized Catholic by Jesuit missionaries. But she was ostracized and persecuted by other natives for her faith, and she died in 1680 in what is now Canada, at age 24. Her body is entombed in a marble shrine at the St. Francis-Xavier Church in Kahnawake, a Montreal-area Mohawk community that was expected to be well represented among the 1,500 Canadian pilgrims who planned to attend the celebrations. Saint Kateri's canonization follows what has been judged a miracle by the church in the 2006 case of a five-year-old American boy who battled for his life after suffering from flesh-eating bacteria. Jake Finkbonner was so close to death that his parents had last rites performed and were discussing donating his organs. His cure from the infection was deemed medically inexplicable by the Vatican, the "miracle" needed to propel the 17th-century Mohawk on to sainthood. Modern miracles typically involve some kind of unexpected recovery from an illness or condition that medicine cannot explain. This recovery would typically occur following the patient’s or family’s prayers to the candidate for sainthood, or their action of placing something like an image or medal near the person in need. In Jake's case, family members placed a Kateri Tekakwitha relic on his leg and they now believe her intercession is responsible for his survival. Jake, now 12 and an avid basketball player and cross-country runner, attended the canonization ceremony, along with members of his Lummi tribe from northwest Washington state. 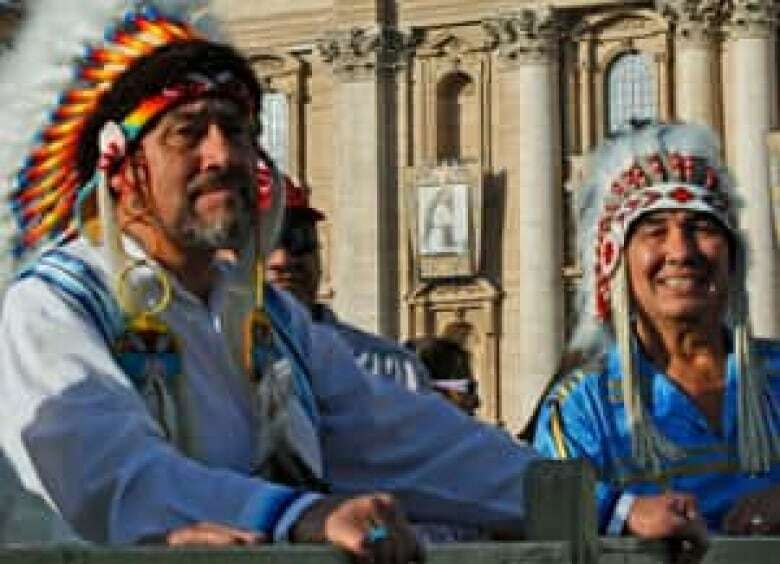 An estimated 2,000 aboriginal people from across Canada and the United States travelled to the Vatican to attend the canonization mass. Also on hand was Sharon Smith, whose cure from complications from pancreatitis was deemed a "miracle" by the Vatican, paving the way for Mother Marianne to be canonized. Mother Marianne, a 19th-century Franciscan nun, was known for her ministry with leprosy patients in Hawaii. She arrived there from New York in 1883 and worked on Kalaupapa, an isolated peninsula on Molokai Island where Hawaii governments forcibly exiled leprosy patients for decades. Anna Schaeffer, a 19th century German lay woman who became a model for the sick and suffering after she fell into a boiler and badly burned her legs. The wounds never healed, causing her constant pain. The Vatican's complicated saint-making procedure requires that the Vatican certify a "miracle" was performed through the intercession of the candidate — a medically inexplicable cure that can be directly linked to the prayers offered by the faithful. One miracle is needed for beatification, a second for canonization. Benedict canonized the seven just before the start of Sunday's Mass, reciting the ritual formula in Latin in which he declared each one a saint and "decreeing that they are to be venerated as such by the whole church." Pilgrims from around the world cheered when the Pope declared each of the seven new saints worthy of veneration by the church. Ron Boyer is the deacon at the church where Saint Kateri is buried and has been fighting for her sainthood for nearly 30 years. He told CBC News that when Kateri Tekakwitha's name was announced, he heard the biggest cheer of all.